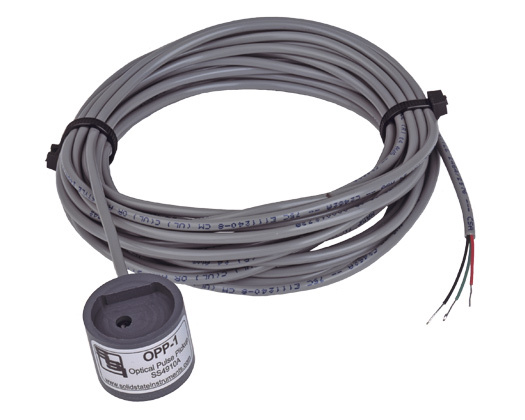 The OPP-1 optical pulse pickup is a convenient and low-cost way to monitor energy consumption information from compatible electric meters with no physical electrical connection. Using the meter’s infrared calibration pulse on the Optocom port, the OPP-1 picks up the infrared light flash (pulse) each time a pre-determined number of watt-hours (usually 1 Kwh) is consumed by the customer’s premises. In this way, the utility, their customer or their energy management contractor can read power from their meter temporarily for doing load survey, demand response or energy management activities quicker and at much lower cost. Solid State Instruments’ unique pulse isolation and conditioning technology allows the calibration pulse to be picked up and converted into standard Form C metering KYZ pulses to interface with power monitoring equipment that uses a pulse input. The electric meter must have the calibration pulse as the default mode on the Optocom port when the port is not being used for data uploading, downloading or other programming activities. 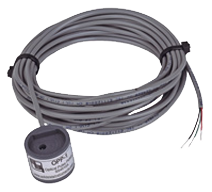 The OPP-1 is a one directional device with read-only capability. It provides a truly secure method of acquiring power monitoring information with no hassle. Input Signal: Input signal provided by detection of the infrared light flash from the meter’s Optocom port. Output: Form A transistor output compatible with input of PCR-3. Output has 3-conductor 25 foot control cable for connection to PCR-3. Mounting: Magnetically mounts on meter’s Optocom port with recessed “D” shape key. Size: 1.20” diameter, 1.00” high.